It was just a week ago that things were looking better. After all, many experts (including us) believed that markets would be placated after a dovish speech by Fed Chairman Powell and a ‘trade truce’ between the US and China addressed two of the market’s primary concerns. However, judging by market action throughout last week, the crowd was far from pacified and instead sent a very different message. What makes this story interesting are the results of a study that measured the efficacy of each of the three lifelines. The most effective lifeline by a wide margin was “poll the audience” which registered a success rate of 91%, scoring well above the second most effective option ‘phone a friend’, which was only correct about two-thirds of the time. To many, the results were surprising, especially when one compares the likely profile of a contestant’s friend to the likely profile of a typical audience member. The friends were undoubtedly a curated list of the smartest subject matter experts that the contestant could find. On the other hand, we would assume that members of the audience were representative of the average American. 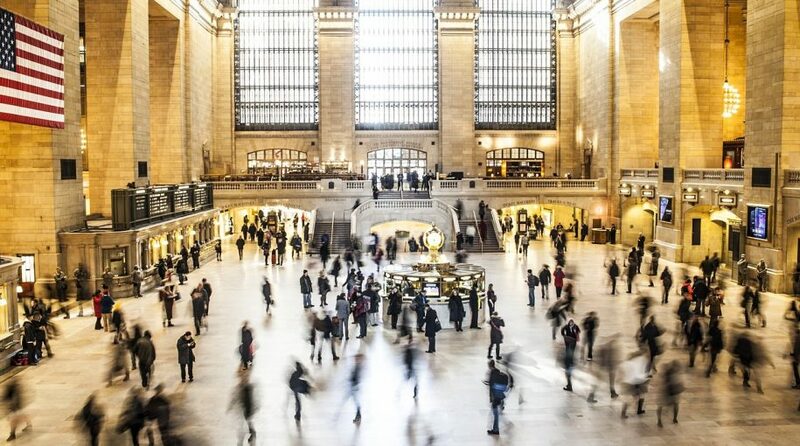 This phenomenon of the crowd outsmarting the expert was well documented in James Surowiecki’s 2004 book The Wisdom of Crowd, and is shown to extend well beyond the world of game shows. In fact, Surowiecki’s study bears particular relevance to the world of investment forecasting. His work suggests that investors should incorporate the opinions of the crowd with the opinions of experts when making investment decisions. One of the best gauges of the crowd’s opinion is the stock market where millions of investors “cast their votes” every day. Paying attention to the opinions of the experts and the crowd is a cornerstone of RiverFront’s investing methodology, which we often characterize as the blending of fundamentals and momentum. Either we find that the crowd is wrong, and momentum begins to turn positive as concerns (trade, rates, politics) get resolved. If that were to occur, we would likely resume a more bullish posture in our portfolios. Or, the experts are wrong and the fundamentals (earnings, valuations, etc.) decisively deteriorate, justifying the opinion of the crowd, in which case we would look to position the portfolios more defensively. Our portfolio management team has plans in place for either scenario and will be closely watching the fundamentals and momentum for a definitive resolution. 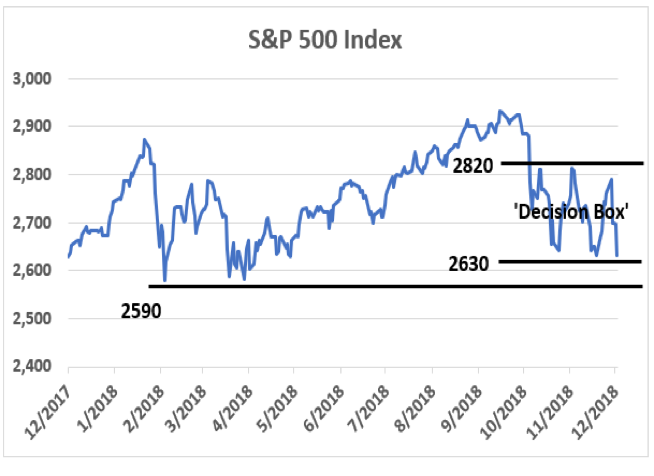 One of the things we will be paying close attention to is the price of the S&P 500 Index, which appears to be in a ‘decision box’. As seen in the chart on the right, the market has traded in a tight range between 2630 and 2820 since mid-October. Source: Factset, RiverFront. Past performance is no guarantee of future returns. Not indicative of RiverFront performance. You cannot invest directly in an index. A violation of that range to the upside and downside would give us some indication of the likely resolution to the two messages. Note that a break below 2590 (second line) would be a clearer signal that the crowd is right since that would violate the February and March/April lows. Importantly, the longer the S&P 500 stays in the ‘decision box’ the longer it is likely to take for the differing opinions between the experts and the crowd to be resolved. Amidst the noise of volatility, we can find important messages that often provide indications of the market’s future direction. The saying: ‘a person’s true character is revealed under pressure’ can also be applied to stocks. Investments that perform significantly better than would have been expected during periods of volatility reflect underlying strength that will likely persist when the market settles down, in our view. Conversely, those investments that perform significantly worse than expectations can be expected to continue to underperform. 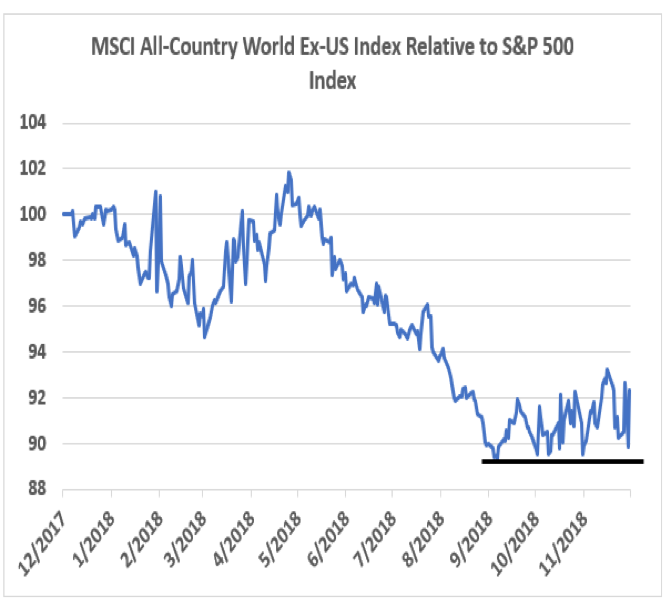 Along those lines, one of the interesting things we have been monitoring is the performance of non-US stocks (represented by the MSCI All Country World Index ex-US) relative to US stocks. As can be seen from the chart on the left, international stocks appear to be bottoming relative to their US peers. This would be one of the first positive relative price signals from international equities since April 2018. Volatility does not always call for immediate action: We tend to give volatile markets wide berths and try to give the fundamentals and momentum the necessary time to resolve themselves. Importantly, the initial days of the resolution process can be blurred by the actions of short-term investors who don’t have the luxury to be patient. These short-term investors are often leveraged and are compelled to act for self-preservation, since costs of leverage and margin increase significantly with rising volatility. During this period, trading flow can be one-sided as ‘forced’ sellers all attempt to exit the same positions at the same time. For this reason, portfolio adjustments during the resolution period can prove misguided and ill-advised. RiverFront still relies on its proprietary risk management process to aid in navigating these periods but recognizes that subjective oversight and proper calibration is required to minimize the risk of getting whipsawed leading to prolonged relative underperformance.